Jukka OH2BR at the operating position of R1MVA. I was born October 26th, 1945, in Helsinki. 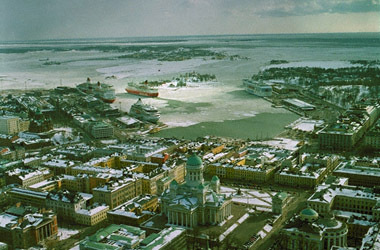 The capital of Finland became my home for the first 23 years of my life. 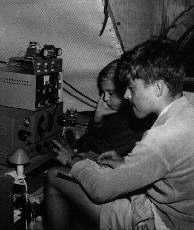 My first exposal to Ham Radio was in 1959 when I was 14 years old and I noticed some class mates (later to hold the calls OH2BS and OH2BU - now VE3XOH) reading interesting literature about Amateur Radio. I joined them and we started as Short Wave Listeners. My SWL call was OH2-762. At the same time, we studied Morse code and radio electronics. This is the very first photo of OH2BR, age 15, taken in December 1960. The first station employs a TRIO 9R-4J receiver, a 15 W XTAL transmitter and a power supply both home made. The first antenna is a G5RV between two 6-story buildings. In September, 1960, we listed on the Novice course at the local club OH2AA. Soon we found out that we knew already most of what was being taught in the classroom. Therefore, we decided to take the novice examination without attending any courses and passed on our first try! In December we received our licences. I became OH2BR. 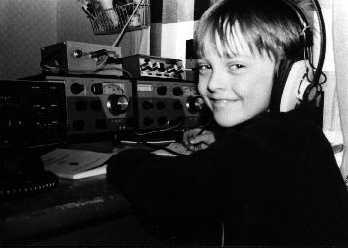 Since then, Ham Radio has been my first love as I affectionally call it. The equipment was modest in the beginning but I went through all the phases of technical progress starting with a Trio 9R-4J receiver and a home made 15W XTAL transmitter, upgrading to a Viking Navigator transmitter, Heathkit HW-100 transceiver, Drake B+C-line and up to Yaesu FT-980, FT-1000 and finally to the current transceiver FT-1000MP. I have always found fascinating to build and experiment with different antennas. Later, discovering the propagation patterns for each band got my primary attention. There was a period when my station included a husky Henry 3KA floor-mounted amplifier. Also some Russian custom made linears were used. RTTY was briefly studied but did not become my permanent mode of operation. With the modern equipment it could be more interesting than with the noisy machines twenty five years ago. My younger brother Miika received his call sign OH2BAD six months later. Being only 12 years old, he was the youngest ham in Europe at that time! During summer 1961 we were portable OH4 at our summer cottage. Long summer nights were spent chasing DX together. Note that the transmitter no longer is home made. 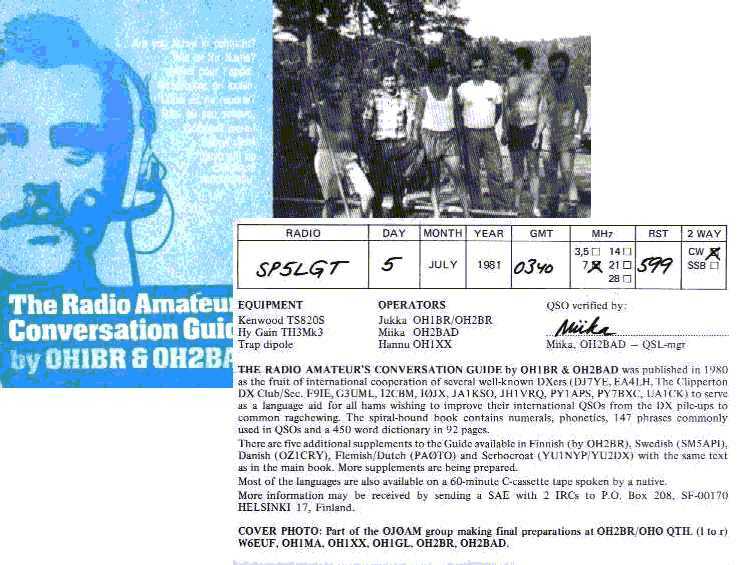 In fact, the author was Osmo Wiio, OH2TK, at that time the President of the Finnish Amateur Radio League SRAL. My younger brother Miika was only 12 years old when he became OH2BAD after watching closely over my shoulder during six months. At that time he was supposedly the youngest ham in Europe. He is also a devoted DXer and has acted as the QSL manager for many Finnish DXpeditions. He is married to Raili who has two ham brothers - Jori OH1QP (owner of Benefon cellular phones company) and Hannu OH1XX (low band world-class DXer). After army service (in the signal regiment, of course!) I dedicated one year to making my hobby into a profession as I attended the Marine Radio Operators´ school organized by the Finnish PTT. Later I received my 1st class International Certificate of Proficiency as a Maritime Radio Officer. 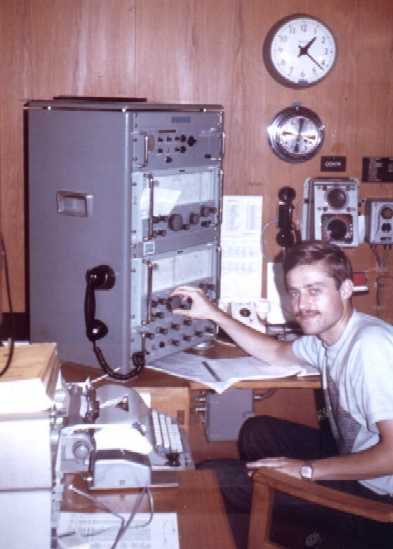 After army service, ham radio led to the profession of a Maritime Radio Officer. This photo was taken in 1969 onboard M/S "FINNBOSTON" OGKM by a colleague, OH2RO. My Spanish and Russian studies were initiated in 1968 at the Helsinki University. The five year long studies were financed by sailing to the USA every summer with the Finnlines cargo steamers as a Radio Officer and, naturally, as OH2BR/MM. After getting the BA degree I worked for two years in the now-so-famous Nokia Corporation, first as a Russian sales assistant and later as the Customer Documentation Group manager. During these two years (1973-75) I was part of the Nokia Company Contest Team, OH2AW. Nokia was in way of funding equipment, mast and antenna purchases for the club´s contest station generously returning some of the profits brought by hams spending countless hours inventing new products. This was the time I discovered the delight of team contesting. We had a ball! In 1969 I got married and my influence on my new love Virpi resulted in her acquiring the callsign OH2BE. By the way, this call now belongs to Leena, the XYL of Martti, OH2BH. Our son Petri, born in 1971, was bound to become OH2NJP in due time. My son Petri trying the headset at the age of seven. He later became OH2NJP. In 1975 I resigned from Nokia and founded the Russian technical translation bureau Transelectro Oy. This company has been my economical backbone for almost 25 years. During peaceful periods in the translation business I continued my Russian studies as a hobby and finally got the MA degree. 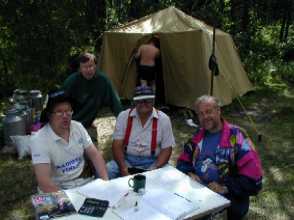 In August 2002 I accepted a new position as the General Manager of the Finnish Radio Amateur League SRAL. Now I do Ham Radio day and night seven days a week! In 1979 I divorced and married my present XYL Loretta, an Armenian from Tbilisi, Georgia (UF6 at that time). She had a solid education from the Moscow State University specializing in economics - good for the family economics, too. So far Loretta has not picked up a callsign but has promised to become a ham some day. Each day of our marriage she is becoming more and more understanding. Part of the OJ0AM group making final preparations at OH2BR/OH0. With free winds blowing from Russia in 1991 we decided to settle in St. Petersburg, and engage ourselves in import/export operations. During four years we were the authorized distributors of Yaesu Musen Co. in the C.I.S. thanks to my old friend Martti, OH2BH, who introduced me to the President of the YAESU Corporation in Tokyo. Good business relationship with the Russian PTT resulted in my securing the local callsign RZ1BR which still is valid and used during my frequent visits to St. Petersburg. 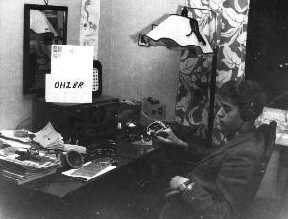 My ham career has, in addition to the usual DXing, included duties as a QSL manager of the OH2 region, DX editor of our national ham journal RADIOAMATÖÖRI (both jointly with my brother OH2BAD), emergency coordinator of the OH2 region, and SRAL representative in negotiations during the 1970-ies with Soviet ham colleagues and PTT officials concerning future DXpeditions to the new DXCC country Malyj Vysotskij Island, first issued the prefix 4J1 and later R1MV. I joined the 4J1FS expedition in 1991 and saw the beautiful island before the houses left by the pre-war Finnish inhabitants were destroyed in acts of vandalism unlashed by the collapse of the old Soviet regime. OH2BR antenna system made by OH8QD in Kerava near Helsinki, 1985. The yagis: 5 el. 15m, 4/4 20m, 3el 40m and 6 el. 10m. As the highlight of my ham career so far has remained the visit in 1966 to the only ham in Damascus, Syria, that time, late Rasheed Jalal, YK1AA, and operating his station using the call YK1BR so generously assigned to me on the spot as he was the head of the Syrian PTT. 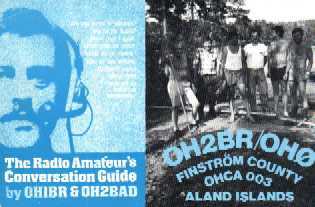 Three memorable DXpeditions were made in 1970s and 1980s to the Aland Islands, OH0. These expeditions led to another one in July 1998 and, consequently, to securing a vanity call OH0BR with future activity in mind. The Radio Amateur´s Conversation Guide was compiled, again as a joint effort with my brother Miika, OH2BAD, and published in 1980. Eight widespread languages were included in the spiral-bound book while five other languages were later added as separate supplements. C-cassettes to support the language studies were also produced in cooperation with native speakers. So far almost 10,000 copies of the Guide have been sold all over the world. The German DARC has produced the Radio Amateur's Conversation Disk on CD-ROM and continues to sell the guide in this modern version. 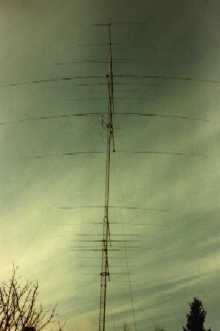 Antenna systems have been for me an especially interesting aspect of Amateur Radio. So far I have built four rotatable 36 m high towers with monobanders in my last four different locations. An 80m 4-square system has been my top achievement on the low bands. It is my firm belief that the antennas, not so much the power, are behind a successful DX QSO. And it is great fun to experiment with antennas! 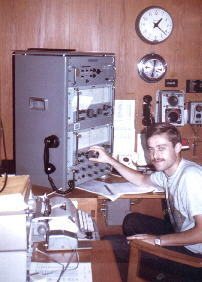 OH2BR at RU1A during CQWW SSB Contest in October 1998. 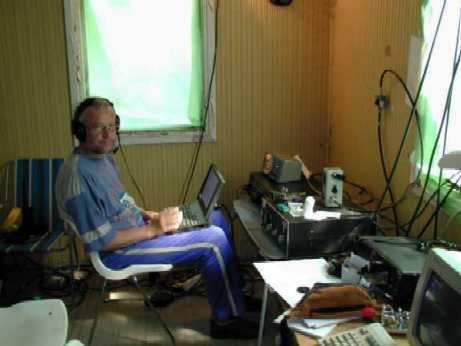 For some time, I was the co-owner of the Canary Islands world class super station enjoying working from this excellent location where OH2BH, OH2MM, OH1RY and some visitors have established world winning contest results. Then I acquired my own super station on an island in Espoo, Finland, and diverted all my attention to improving it for DX and contest activities. 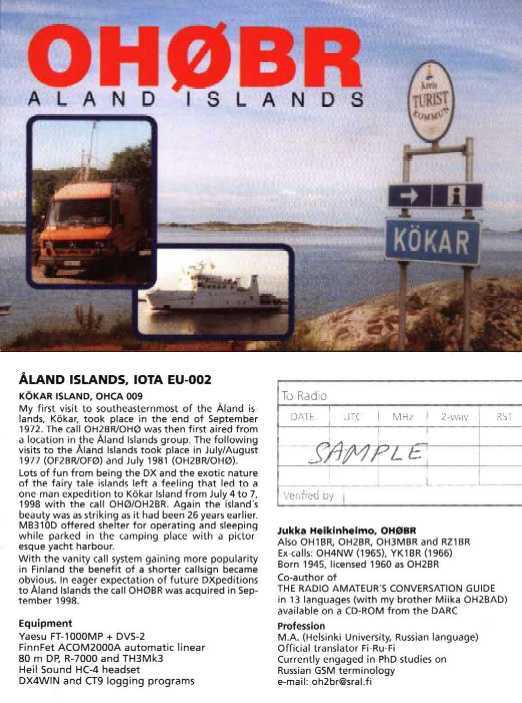 In June 1998 I had to sell the island but I will soon have a super DX station near Helsinki. A highlight in my contesting career was the participation in the CQ WW DX SSB Contest in October 1998 as a member of the RU1A team. This fine bunch of young, enthusiastic hams have a top notch contest QTH 150 km south of St. Petersburg with YAESU FT-1000MPs, big linears, towers and antennas (even a three-element full-size 80m yagi!) allowing them to show a respectable result each time they enter in a major world-wide contest. R1MVA Team on Malyj Vysotskij Island, July 1999. A joint OH/UA DXpedition was made to Malyj Vysotskij Island, R1M last July. Besides being a member of this DXpedition, OH2BR undertook the duties of a QSL manager for R1MVA. On my last visit to MVI I was part of R1MVZ Team, participating in the CQWW DX SSB Contest in October 1999 with five top contest operators from the USA. QSL manager for this operation is K6VNX. 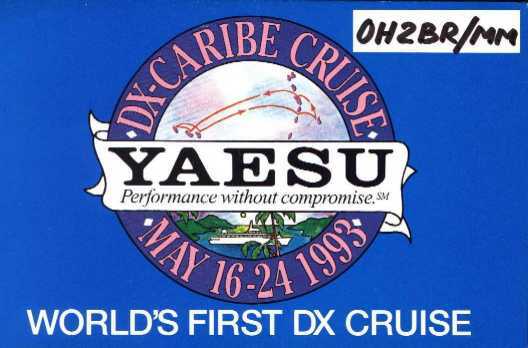 During my whole ham career I have been deeply interested in distant and exotic places, first having a QSO with them and getting to know the people living there but recently more and more trying to visit those places myself. In Finland we have so many good examples of DXpeditioning - OH2BH, OH2MM, OH0XX, OH1RY and many others. One of these days, I hope, my dream will come true - being in the DX end of a huge pileup giving out new country QSOs on all HF bands as fast as I can. What about places like Pitcairn, Tristan da Cunha, Juan Fernandez? As far as I am concerned, the very sound of the names of these distant islands in the ocean starts to pump adrenaline in my veins. I guess that means I am addicted to DX. I hope you have enjoyed reading this story. I also hope to meet you soon on any HF band. In the meanwhile, I continue planning a DXpedition to a distant rare island! That island will be Pitcairn and my call sign has been confirmed as VP6BR. The Commissioner for Pitcairn Islands has told me that my application to land and reside had been approved by the Pitcairn Island Council. 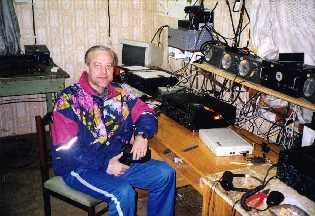 My dream is becoming true in the year 2000, when I will be celebrating my 40 years in Amateur Radio. New plans are in the works for more DXpeditions after the Pitcairn journey.